Podcasting can be a powerful marketing tool for your business, regardless of which side of the microphone you’re on. As a podcast expert, Matt Johnson teaches that everything comes down to the foundation of what is the clear and compelling idea of why people should listen to you. If your podcast doesn’t build a sense that you’re the expert, then it doesn’t accomplish the mission. video view on Facebook is an achievement. Most of them are going to be 3-5 seconds, and that’s assuming they even turn the sound on. And so we’ve got these options and everybody has an opinion on what works. Everything works for somebody, which is the problem. There’s no shortage, you can find a case study for anything, something works for somebody. But is it really the best use of your specific time and does it build a relationship with a group of people who are eventually going to write you a check. And to me that’s where podcasting makes a difference, because podcasting is a way for people to really engage with you for a longer period of time, their attention spans are longer for podcasts because they can do other things while they’re listening, audio is kind of an intimate form of communication with somebody. Like, you’re literally in their earbuds with them, so the relationship that they build with you is insane. I’ve had people come up to me at conferences and start off with an inside joke from my podcast, and I have no idea who they are. So one of the inside jokes is, my cohost on my first podcast and I did some sales role playing. First he invented me a fictional wife, then I had one fictional child, that became two, and then three, and now I think they’re insulin-dependent diabetics. So anyway, I’ll have people come up and ask, “Hey, how’s Julie and the kids?”, and just fun things like that, and I have no idea who these people are. They feel like they have a relationship with me because they hear my voice two or three times a week, and there is no two-way relationship. But they are ready to hire me, buy something from me, because they feel like they have a relationship. If you’re a small business owner, I don’t think there’s anything more valuable in the world than a group of people who are your potential clients, either now or will be, and they already feel like they have a relationship with you. There’s already trust. And you know this, trust is so hard to build and it’s hard to keep, and people are less and less trusting nowadays. 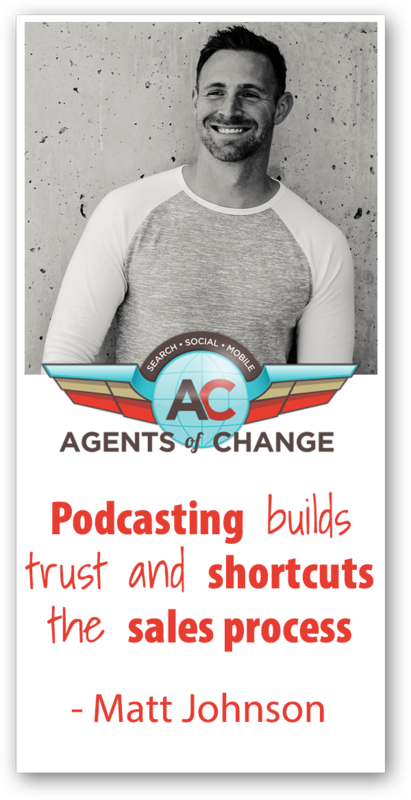 And to me, podcasting builds that sense of trust and shortcuts the sales process by building that trust. Rich: I absolutely love that, and it is true. I think sometimes people stay away from podcasting compared to blogging or video, because it seems like the numbers aren’t there currently for podcasting. But what you forget is, depending on your business, sometimes you only need a few customers to really make that investment. And yes, I’ve put in countless hours into this podcast over the years, and then my team has put in more with the editing and promotion, but some of our biggest ongoing clients have come from that podcast because they are listening to me and they hear me and there is that trust being built up just like you said. Matt: I think probably the average small business owner who is really focused on giving great service to their clients and their customers, probably while they underestimate what it feels like to be in a conversation with somebody who always looks to you as the expert. They’re so used to having conversations where they have to prove themselves and they have to give credibility and you’re trying to build all of that in the sales conversation. It’s insane. When you show up to a conversation and they already think you’re the guru of whatever you sell, it completely changes the quality of that conversation. I’m sure you’ve experienced it if you have people that are coming to you off of your podcast because they listened to you first. You know viscerally it feels different to have that conversation versus a cold conversation. Rich: Absolutely. So someone is out there right now and they’re listening to this and they’ve been listening to the Agents of Change podcast and maybe some other podcasts for a while, they’re finally ready to jump in. Matt, what are some of the first steps that they should take? Matt: Well, a couple things. I get this question a lot because I think it’s that podcasting feels very daunting. Just because I think there are some small technical details and if you don’t realize they’re not that hard, it feels bigger than it really is. I had a client come to me, he’s a fellow agency owner, he had been running a really cool show behind the scenes. He would just invite a guest in and he would set everybody up on Zoom, he would send an invite out to 50 people in his database that he thought would enjoy hearing from that person. And he would say I’m going to have this person here on Zoom, you’re all welcome to join in, we’ll interview them for about the first 20 minutes, and then we’re going to open it up to question after. I’d love to see you there, here’s the Zoom. He ran that for a year before he showed up on my doorstep and said we should turn this into a podcast. So that’s one of my best pieces of advice I can give to anyone is just start somewhere. Start with whatever you’re comfortable with because you can always turn it into a podcast later. You don’t have to go right out of the gate with the biggest most professional thing right away. You can start with something behind the scenes, you can start with something on Zoom, you can even do just conference calls because conference calls can be turned into podcast episodes later. So that’s #1. Then the other thing is maybe just focus on being a guest. If you’re a small business owner or you’re an expert in something. And if you’re an expert, there is somebody out there who is willing to interview you on their show and you can always start that way first to see if you just enjoy having those types of conversations before you decide to launch something that’s your own that’s brand new for you. Rich: So you mentioned getting on other podcasts and you also mention the fact that you kind of launched this company to help train people to get on podcasts. What are some of the tips that you might be able to share with us today if people are interested in getting some opportunities as guests on other podcasts? Matt: And this is a problem I have in my own business. We’re all busy and if you’re a small business owner you’re super busy and it’s hard to take time away. It can be done, you can do it yourself, in the sense that you can go out and go to iTunes and just Google “top 10 podcasts for x (your space)” and you can find the podcasts. They’re actually not that hard to find and it’s not hard to find the email information for the host, because most of the time they want to make that public and they want to make themselves relatively easy to reach. So the question that most people get stuck on is what do I say when I reach out. So my answer to that is just really just focus on coming up with what your storybook is, what’s the thing that makes you and your business and your expertise a little bit different or surprising, or what kind of stand can you take that your competitors are not willing to take. So, what are you willing to say that’s a little bit different. As long as you’ve got that you can boil that down to a couple of sentences. It’s pretty hard to send a pitch email out to a podcast host, which will get completely ignored. And they’re looking for people that are interesting to interview that have surprisingly different things to say. So if you have something like that, it really just comes down to reaching out, saying that you came across their podcast and I think I might be a good guest for you, here’s what I’d like to talk about, if you’re interested let me know and we can work out some details. It really can be that simple. The only problem that I found is that when I put that burden on myself to do all that, it just doesn’t happen. There’s my time and my mental energy and my focus that goes into the business and just wasn’t on that. And that’s why I build the training to have that internal staff do it. So if you’ve got like an intern or a marketing assistant or even your personal assistant to do this for you, they just have to be equipped with the right system. And so I build that system to kind of solve that problem, because I saw it in myself, and all of my clients and friends in that space needed that same thing. They all had somebody that probably could be pitching them, they all had some intern or assistant or somebody, they just didn’t have the right system to do it. And so I just kind of built out that system. Rich: Now Matt, you’ve obviously been a guest on a lot of podcasts out there. Do you have any suggestions or tips on what – if you are a guest – what your goal should be? Like, do I have something that’s downloadable that I offer this audience, am I trying to build my list, am I just excited to be on a show, am I looking to get a link form their website to mine? Like, what should I be trying to do if I’m a guest on somebody else’s show? Matt: Well, if you know exactly what you’re selling, the primary call to action I think should always be, “Hey, If you’re interested and you want to talk about working together, here’s where you go.” I think that should always be your primary call to action. But I think there’s plenty of room for a secondary, which is some way to get onto your email list. Rich: Alright. Now it’s been said the riches are in the niches. But most of us would still like to have a larger qualified audience size. What have you done to build your own audience, and what might work for some other podcasters? Matt: Well there’s a couple of interesting opportunities. I had Rob Walch, the VP of Libsyn on my show a couple months ago, and there’s definitely some interesting things coming down the pipe, Alexa is one of them. For the most part, if you already have a podcast you can submit it so that people can play your podcast on Alexa, they can say, “Hey Alexa, play Real Estate Uncensored”. There’s some interesting opportunities with Alexa flash briefings, but that essentially requires you to start a whole new show because it’s one minute snippets. And there’s also some opportunities like putting your podcast as an app in the app store. That’s one of the things that Rob mentioned that I hadn’t really thought about. And so there’s some different things like that. To me, everything comes down to the foundation of what is the clear and compelling idea of why people should listen to you. And this applies to whether you’re the guest or the host. Just really zeroing in as much as possible and making sure that the idea of why somebody should listen to you is very clear, but it’s also very compelling. And a lot of times we misfire on one or both of those. Or we have an idea that we think is clear and it’s not, and nobody else understands us. And we might have compelling things to say but we haven’t really put a nice sharp point on it. Or, we’re clear but we’re also ordinary. I get pitches all the time for my podcast from people that want to come on the show, and they don’t understand that there’s 5 other people that already pitched me on that same topic, they’re not really saying anything that’s extraordinary. Unfortunately, they’re very clear but they’re also ordinary. And so what we’re going for is we want something that’s a clear and compelling idea for why people should listen and pay attention to us. So that’s the best piece of advice I can give, because if you end up starting a show and you want to know the best way to grow, the best way to grow is to give something to people that’s so clear and compelling that they can tell their friends and their colleagues about that is socially rewarding for them to share. Like it gives them some bump in status just by sharing your show. Rich: Right. And the one thing that I would add kind of as a side note to that is talking about pitching. If you are going to be pitching or somebody on your team is going to be pitching, they should definitely know the show that they’re pitching. Because the number of times a week that I get a pitch about somebody who grew their business from zero to a million miles an hour overnight and they want to come on the show to talk about it, I’m like, we’ve never done that show. We would never do that show. It sounds like a fascinating show, but that’s not what this podcast is all about. And then sometimes if I’m in a good mood I’ll tell them what I really am looking for. But generally it’s like, if you are out there pitching yourself or pitching for your boss, you should definitely make sure that you understand what the podcast is all about that you’re pitching. Matt: Yeah, I couldn’t agree more. Rich: So what are some of the mistakes you still see people making when it comes to podcasting these days? Matt: Well I think people’s attention spans are going down, so I’m recommending to clients to keep their interview conversations down to around a half an hour. Rich: Ok, and we’re wrapping up here! Matt: Exactly. Yeah, so keeping it shorter, I think people’s attention spans are getting lower. And then definitely if you’re an expert and a small business owner – especially if you make a living off of what’s in between your ears, your expertise, insight, and creativity – the one caution I’ll give you is when you get into podcasting it’s really tempting to have a bunch of conversations with awesome people and that does a lot of great things. What you don’t want to happen though, is that you spend so much time focusing on other people that your own voice and your own message gets lost in the shuffle. So making sure that if you’re hosting a podcast – and I work on this myself – the interviews kind of show up on my calendar and I don’t have a choice, I show up and do the interviews. What’s tough for me is doing the solo episodes where I deliver my message to my audience. Because that’s up to me. And sometime if it’s up to me it just doesn’t get done. So I have to put it in my calendar to write something up and force myself to sit down and record it. Because at the end of the day, if my podcast doesn’t build that sense that I’m the expert, then it doesn’t accomplish the mission. Rich: Alright, so I love that because I do solo episodes usually only when I’ve forgotten to book a guest for the week. And then I can’t think of one intelligent thing to say. So I love the idea of booking some time for myself, almost interview myself. Do you have a ratio that you’re going for between solo episodes and interview episodes? Matt: Yeah. So with our clients we recommend 2 high level guest interviews a month, at least one solo episode or two, and if they have an extra week to fill or they don’t have the content for a solo episode, grab one of their successful clients and do a case study. That’s our formula. Rich: That’s very interesting. Awesome. Hey, this has been great and I’m sure a lot of people are going to be interested in learning more about you, where can we send them? Matt: So the main way – because I mentioned just having two different calls to action – so if you’re interested in the done for you podcasting where we actually work with businesses and consultants, that’s pursuingresults.com. And then you mentioned the training as well, that’s the best way to kind of get started pitching yourself or an assistant to learn to pitch you, that is at pursuingresults.com/training. Rich: And as always those links will be in the show notes. Matt, thank you so much for showing up today, I really appreciate it. I enjoyed our conversation. Matt: Yeah, me too, it was a blast. Matt Johnson understands that podcasting leads to building better relationships with your clients and prospects. That’s why he created a hassle-free system to help you break into podcasting. Or, if you’re looking to be a guest on podcasts, he can help with that, too! Rich Brooks is the President of flyte new media, a web design & digital marketing agency in Portland, Maine, and founder of the Agents of Change. He’s passionate about helping small businesses grow online and has put his 20+ years of experience into the book, The Lead Machine: The Small Business Guide to Digital Marketing.